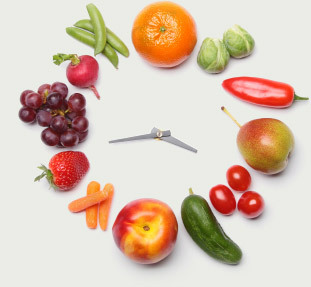 Managing the "internal clock" of vegetables may boost their health benefits. If you've ever traveled across time zones, you know how difficult it can be to adjust to your new environment; your body's "internal clock" takes some time to reset itself. In a series of exciting new studies, scientists have discovered that not only do vegetables also have internal clocks, but that managing these clocks may boost the health benefits of the vegetables. Researchers at Rice University and the University of California at Davis discovered that plants can "tell time" through their circadian clocks -- and increase production of insect-fighting chemicals around the time that insects start to feed. How does that affect us? Some of these anti-insect compounds are valuable to human health, including an antioxidant with known anticancer properties that has been studied in broccoli and other vegetables. "Vegetables and fruits don't die the moment they are harvested," said lead research Janet Braam in a press release. "They respond to their environment for days, and we found we could use light to coax them to make more cancer-fighting antioxidants at certain times of day." Braam and her team used controlled lighting to regulate the internal clocks of fruits and vegetables including cabbage, carrots, squash and blueberries. Though the scientists have not determined whether all-dark or all-light conditions shorten the shelf life of fruits and vegetables, their research suggests that storing produce in dark trucks, boxes and refrigerators may reduce their ability to keep daily rhythms. "It's exciting to think that we may be able to boost the health benefits of our produce simply by changing the way we store it," said study lead author Danielle Goodspeed. You may be interested in: Delicious, easy ways to sneak more fruits and vegetables into your diet.